According to Ron Cole, Manager of the Tulelake Fish and Wildlife Refuge, these groups "have a signed agreement which states that the BOR will make their best effort to replenish the water the refuge releases. They will help the Refuge maintain our permanent wetlands and provide summer and fall water, benefiting millions of fall migrants and other species such as pelicans, turtles, wading birds, nesting waterfowl, and a variety of wildlife dependent upon these wetlands." So yesterday at a press event on Lower Klamath Refuge, representatives from each group spoke to the small gathering. Around twenty people, including the speakers, farmers, and the press, came to hear what the representatives had to say about this partnership. 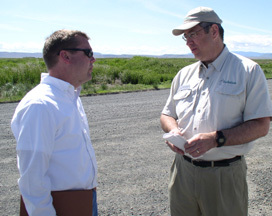 I was able to chat some with Dave Eshbaugh, Executive Director of Audubon Oregon. When I and many others heard about interaction with 'Audubon', we were skeptical, if not downright pessimistic, to say the least. Until 2001, I thought that Audubon Society was a warm-and-fuzzy group that protected wildlife. That seemed like something they should do. So in our discussion, I related my fears to Dave Eshbaugh, only because, speaking of warm and fuzzy, this is the nicest guy you'd ever meet: a big smile, oozing with sincerity. Unlike some other environmental group representatives whose groups have sued us and decimated our farms and community and economy and refuges in the name of "environmental", this guy seemed to be nice. He began by telling me about the phone calls that he was getting from environmental group representatives who are upset that he is even talking with us farmers. They feel farmers and Audubon have nothing in common. Made sense to me. So I related to him the input that I've been getting from fellow farmers and ranchers and other caretakers of the local bird habitat. I explained to him that when the Klamath Audubon sued us to take water from farms and wildlife, it left us with a bitter taste regarding Audubon. He said that his first step in a solution is, "no lawsuits." That sounded good. Then I said that I looked up 'Audubon' on the internet and typed in Klamath. Article after article, magazine after magazine, was focused on getting rid of the Klamath Farmers, propagating the myth that we'd ruined the basin and the whole ecosystem of the watershed, and it was enhanced by pictures of dead fish hundreds of miles from here. He said that he has seen what good the farmers are doing here, and that the distant city folks who have never even been here do not understand the union with the wildlife and farms. He explained how impressed he was to see the hundreds of birds feasting on Steve Kandra's alfalfa crop, and how necessary that feed is to the wildlife. He said Kandra lost $30 thousand worth of crops, his contribution to our local wildlife here. So his mission, he says, is to educate the people elsewhere on how farmers and wildlife managers are working together in our community for the mutual benefit. I added that, at last weeks Klamath Water User meeting of several hours, I don't recall hearing any mention of canals and ditches and practical irrigation issues. All of our energy, and much of our funds (which are not tax-exempt contributions but money earned by hard labor) are being used in defense of a multitude of groups who are suing us and who haven't a clue of the relationship of family farmers with wildlife in the basin. They have not a clue about the hundreds of restoration/conservation efforts that have been are are presently being done. They sit in their office and are paid to sue us. He seemed determined to educate the masses. When I asked what he was going to do, he mentioned bringing awareness to other Audubon groups and to the schools. I proceeded to tell him that the Oregon Natural Resource Coalition, ONRC, an environmental group who sues us and spreads myths about our stewardship of the land and wildlife, is in a partnership with Klamath Audubon Society. He said that the Klamath Audubon does not necessarily have the same philosophy as the National Audubon. Then I told him that the National Audubon website is unfriendly towards Klamath Farmers. I asked him if he had seen the ONRC website's teaching tools for children, posters saying "Cows Kill Fish", etc. He had seen it. That is not his idea of educating children. He pledged that he was going to try to make things different. I told him that every time, so far, we have heard that from groups and agencies, they turn around and sue us or spread false media. But I also said, there isn't one of us who doesn't want to believe that there is hope. Think how much we could have done for people, the land, the community, and wildlife, if we could have spent our money and energy on being productive partners rather than being constantly sued and having to focus on defending ourselves. The relationship toward Fish and Wildlife has also been strained with their habitual goal of trying to get farmland out of the refuge. Read their yesterday's speeches. It looks like we may now have some leaders in USFWS and Audubon who honestly recognize the union, the necessity, of farmland and wildlife. Will they be willing to put themselves on the line to educate others, others who have an agenda of exterminating farmers from farmland? An agenda more important to them than working together toward what is best for the soil, the people and the wildlife? Eshbaugh said we will know his sincerity by the good things they plan to do here along with the farmers on refuges and on private farmland. Read their speeches (links above). And think of what progress could be made, if only, if only............This looks like a hopeful beginning.